Aloff, Mindy, “Film Translations of Meredith Monk’s Work,” pp. 102-06. Armelagos, Adina, “Yoshiko Chuma: Knocking, Chomping, and Bumping,” pp. 28-32. Banes, Sally, “Theatre of Operations: Stuart Sherman’s Fifteen Films,” pp. 87-101. Buchsbaum, Jonathan, “Sleepless Nights,” pp. 168-70. 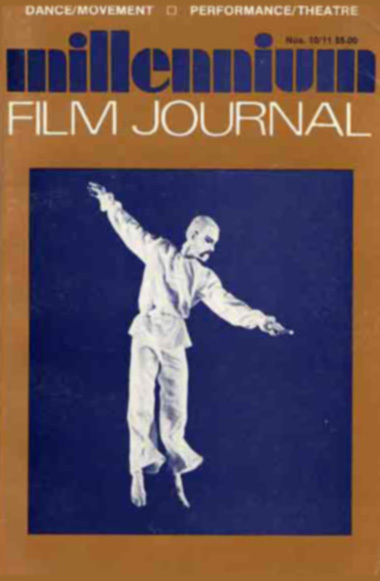 Carroll, Noel, “Causation, the Ampliation of Movement, and Avant-Garde Film,” pp. 61-82. Chong, Ping, “Performance and Film: A Statement,” pp. 83-86. Davidson, David, “Myths and Texts: Joanna Kiernan’s Dream Work,” pp. 204-09. Elder, Kathryn, “Report from Toronto,” pp.176-80. Epstein, Jean, “Cine-Mystique,” trans. Stuart Liebman, pp. 191-93. Estevez, S. Ann, “George Landow’s Marriage Broker Jokes,” pp. 200-03. Fischer, Lucy, “Rabbit’s Moon: The Pierrot Figure in Theater, Painting, and Film,” pp. 123-39. Gunning, Tom, “Doctor Jacobs’ Dream Work,” pp. 210-18. Hanlon, Lindley, “LeWitt/Childs/Glass: Film/Dance/Music,” pp. 43-54. Jowett, Deborah, “Dune Dance,” pp. 23-27. Kaplan, E. Ann, “Night at the Opera: Investigating the Heroine in Sally Potter’s Thriller,” pp. 115-22. Kronen, H. B., “From Cimabue to Cunningham: A Discussion with Richard Lorber,” pp. 5-17. Levine, Mindy N., “An Interview with Pooh Kaye,” pp. 33-42. Liebman, Stuart, “Introduction to Jean Epstein’s ‘Cine-Mystique,'” pp. 186-90. Macdonald, Scott, “Plumb Line,” pp.111-14. Marchetti, Gina and Keith Tishken, “An Interview with Scott B. and Beth B.,” pp. 158-67. Norden, Martin F., “The Use of Sound in Francis Thompson’s N.Y.,N.Y.,” pp. 219-22. Sharrett, Christopher, “Epiphany for Modernism: Anti-Illusionism and Theatrical Tradition in Syberberg’s Our Hitler,” pp. 141-57. Simon, Larry, “Music and Film: An Interview with Michael Nyman,” pp. 223-34. Sommer, Sally R., “Robert Wilson’s Video 50,” pp. 107-10. Stam, Robert, “Jean-Luc Godard’s Sauve Qui Peut (la Vie),” pp. 194-99. Sturken, Marita, “Interview with Robyn Brentano and Andrew Horn,” pp. 55-60. Vaughan, David, “Locale: The Collaboration of Merce Cunningham and Charles Atlas,” pp. 18-22. Vieira, Joao Luiz, “Tropical Disease: Towards Development of an Alternative Cinema in Venezuela,” pp. 171-75.